At Under One Sky we believe in each youth’s ability to rise above their circumstances and achieve wholeness of mind, body, and spirit. Honored by the strength and wisdom the youth bring to the Passages program, we aim to help them find new ways of rediscovering their many talents. 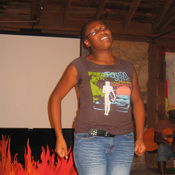 This song was written and performed by Under One Sky staff and youth in the spring of 2007. Recorded at Whitewater Studios in Asheville, North Carolina, “You Never Know Who I Can Become” was first performed at the 2007 North Carolina Foster and Adoptive Parent Association Conference in Raleigh by six youth in our program. The lyrics were inspired by poems and short stories written by youth during a 2006 writing workshop led by Lynn Rhoades and Nathan Freeman of Pen and Voice. 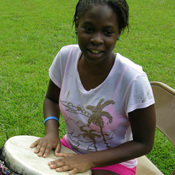 After helping the youth rehearse for a camp-wide performance of their poems and stories, music instructor-mentor Cindy Hospedales wrote the lyrics and music. The song is a testimony to the strength, endurance, and hope that youth in foster care have for themselves and each other. Download Song, "You Never Know Who I Can Become"
2008 was a busy year for the Youth Advocacy Council. After presenting a panel workshop at the North Carolina Foster and Adoptive Parent Association Conference in Winston-Salem, three youth presented to national audience at the Children’s Bureau conference in Washington, DC in August. After hosting a local panel on foster care and adoption in Asheville, NC, youth presented at the Virginia One Church One Child conference in Williamsburg in late October. Quite a year! Youth in the Passages program are invited to participate in the Rites of Passage Council when they feel ready for deeper work related to who they are and where they’re headed in life. The Council, made up of Under One Sky staff, elders, and peers provides the youth with an opportunity to make a conscious and healthy passage into adulthood. The Council meets during each camp session, devoting time to each other’s stories of growth and challenge. Native American traditions like the Sweat Lodge help youth to recognize old patterns and beliefs that no longer serve them as they mature and grow into healthy adults. 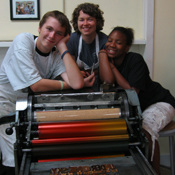 Three youth completed the solo experience in 2008 and two more are preparing for their solos in Spring of 2009. There’s also a second group starting the Rites of Passage program. The Sweat Lodge was an awesome experience. To me, it was something special. In the beginning I didn’t think I could do it [Sweat Lodge], then I found the strength to do it. It caused me to feel like a new person. Before the Sweat Lodge, I was influenced by people I hung out with—by whatever mood they were in. After the Sweat Lodge, I didn’t care anymore—I was just me. I didn’t follow other people’s moods. My body felt lighter—like it gave me more air and room to pray. The Sweat Lodge included all religious beliefs and I could pray to my belief..
Brandon Nivens, age 18, was adopted by his mother Beverly in 2007 after living in foster care for many years. Already an accomplished singer with his school and church, Brandon has written nearly a dozen songs for and about youth in foster care while enrolled in the Passages program. He says that he wants to inspire and give hope to other youth who are in foster care through his music. In the process of writing these songs, he is also teaching himself how to play the piano and write arrangements. This past year, Brandon taught a workshop entitled, “Using Youth Voice” –designed to encourage youth in foster care to express themselves and advocate for their needs. Copyright 2007 by Brandon Nivens. All rights reserved. “Thank You” is an inspirational song written and performed by Under One Sky youth Brandon Nivens after being adopted.